Be safe. Be in control. 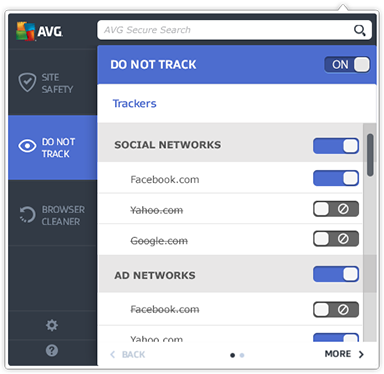 Simply download this FREE browser add-on now to automatically add it to your favorite browser for more secure, private browsing. Secure Search warns you of unsafe search results so you can browse safely and confidently. Site Safety gives you clear safety ratings for the websites you visit, and shows you which search results are safe to click. Available for Firefox & Internet Explorer only. Do Not Track shows you which websites are collecting data on your online activities and allows you to block or allow them. 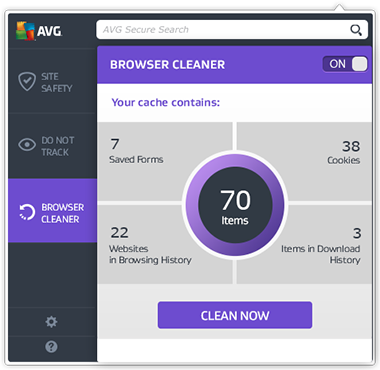 Browser Cleaner protects your privacy by deleting all of your browsing history and cookies with a single click. You can change your default homepage and search provider at any time. 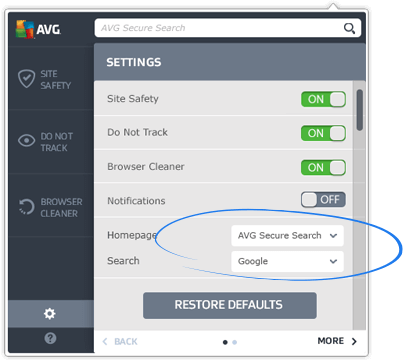 Just click the AVG logo to open AVG Web TuneUp, and then click the settings icon. Your homepage and search provider can be changed from there. Full functionality available for Internet Explorer® and Firefox®. For Chrome®, only Secure Search is available. © 2017 AVG Technologies. All rights reserved.